AND MAKE A STATEMENT WITH EACH SMILE! What is DecoDent Tooth Jewelry? 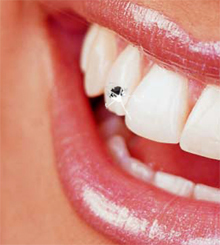 Tooth Jewels are small crystals or gold jewels temporary attached to your teeth without any harm. Is is the latest fashion in body art sweeping the planet. Best of all: Tooth jewels are a reversible and temporary fashion! Adding some sparkle to your smile can be done without pain in just a few minutes.